My inbox receives a lot of junk email promoting investment newsletters; most such email gets discarded without review. A recent piece caught my attention, perhaps because the claim seemed so bold — $150+ oil by mid-year. The claim (by Kent Moors of Energy Advantage) was backed-up by the writer’s research showing that if oil prices fall to such low levels so as to make drilling new wells unprofitable (like at the end of 2008), for every week that the number of drilling rigs in operation remains below average (following the bottom in oil prices), it takes 2.5 weeks for that missing drilling capacity to come back on-line. In the case of the oil bear market which bottomed at the end of 2008, oil drilling remained below average for about a year thereafter, until the end of 2009. The key observation is that you can forecast the timing of a future peak in oil prices by multiplying that below-average drilling year by 2.5 and adding that time chunk to the beginning of 2010 to project a peak in oil prices by mid-year 2012, plus or minus three months. The rise and peak in oil prices arrives due to a predictable supply deficit. Below is a chart of light crude oil prices over the past five years. 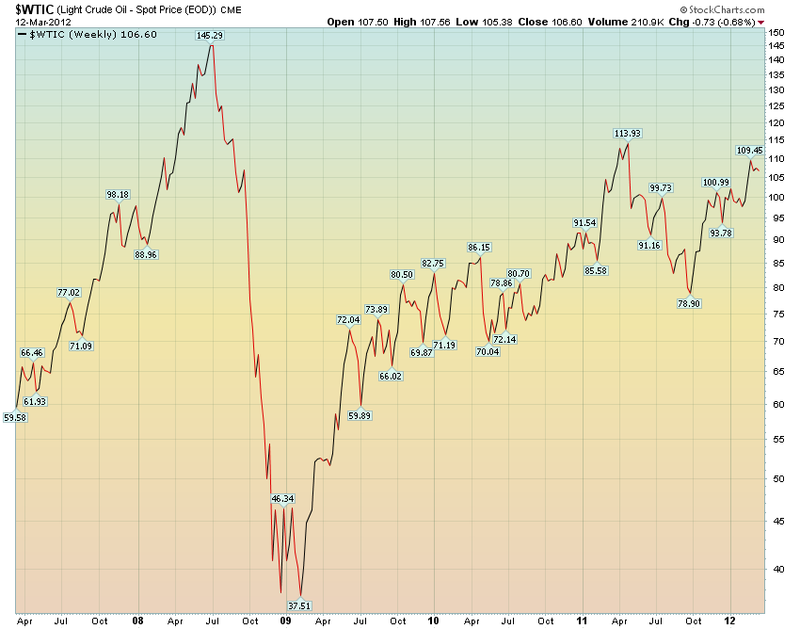 The bottom line –financial assets related to oil should outperform into mid-year 2012. I spend a lot of time analyzing the economy and securities. The effort has enabled me to generate multi-thousand percent returns on my trading capital over the past twelve years. The next few years offer an incredible opportunity to take outsized gains from the markets. Large structural imbalances in the major western economies will result in enormous market volatility as the imbalances get resolved, offering generational money-making opportunities. The major imbalances are excessive sovereign debt, crazy risk concentration in major banks, and enormous derivative exposure in the financial sector. A systemic shock can easily create a default cascade through the financial system where one failure precipitates another and another and so on. Central banks are very aware of the risks, and they are filling the financial system with liquidity by printing new money, risking massive inflation in a few short years for the United States and Europe. China has 2-3 trillion in dollar exposure, and they would like to have far less for fear of continued currency devaluation (they've lost billions holding dollars as the value erodes). As the size of their holdings prevent them from rapidly liquidating their dollar assets (which includes U.S. treasuries), they are instead spending their dollars on resources (copper mines, rare earth metal mines, oil wells, etc.). Lately they have been accumulating gold assets, perhaps with a view to making the Renminbi convertible into gold and displacing the U.S. dollar as the international reserve currency. Their gold buying is enormous and presents an easy investment thesis: ride the Chinese horse and buy gold and gold stocks. In this blog, I'd like to share some of my trading ideas and insights on the markets as these exciting times unfold. Aside | This entry was posted in Investing, Markets, Stocks and tagged crude oil prices, stock market, west texas intermediate light sweet crude oil prices. Bookmark the permalink.